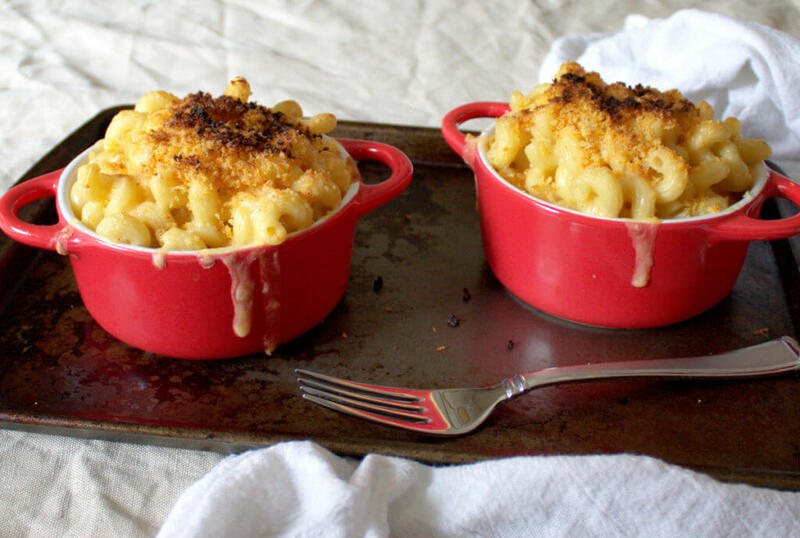 Who doesn’t love macaroni and cheese? It’s an age-old classic that many of us have fond memories of from childhood. But who says that mac and cheese has to be relegated to the kids table? We decided to take this classic and dress it up to make a fancy mac and cheese recipe just for adults. The decadent blend of cheeses and toppings take this from a kids dish to an adult’s new favorite. 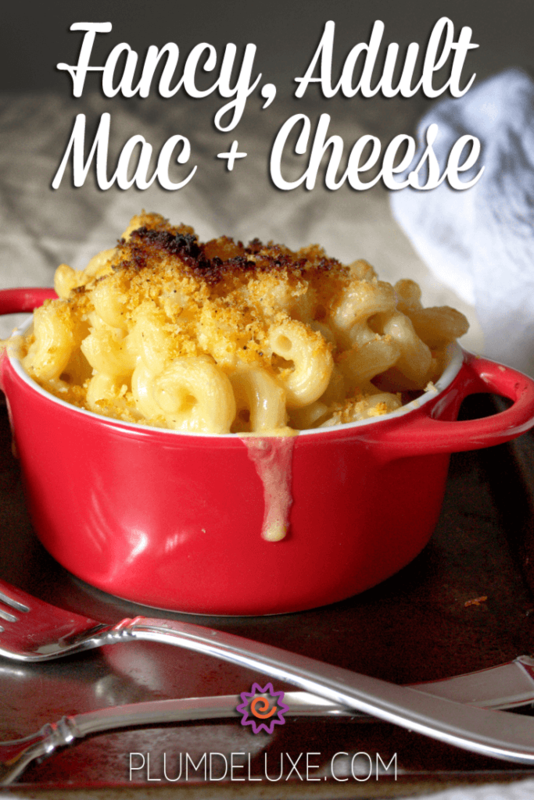 With the image of a soothing, delicious, and uncomplicated macaroni and cheese in mind, we kept this recipe pretty simple and just elevated the ingredients. A blend of cheddar, gruyere, and pecorino cheeses is stirred into a classic béchamel sauce to create a perfectly creamy sauce. This blend creates a buttery, slightly nutty flavor that really changes the whole dish. This is a cheese sauce made for adults. To finish it, we added buttered, spiced panko breadcrumbs and bacon crumbles to the top. Smoked paprika goes wonderfully with a well-smoked bacon and the decadent cheese sauce. The combination of smoke and spice is a fun addition to round out the creaminess of the overall dish; add more or less heat depending on your preference. The little bit of crunch supplied by the panko topping is the final touch to complete the package. For the ultimate in evening comfort, wash down this dish with a cup of our Candlelight Blend white tea. Its hints of orange and champagne will be the perfect calming cap to round out your evening. This mac and cheese is fancy enough to serve at your next party. Try preparing individual servings of it, or bake up small bites in a mini cupcake tin for a cocktail party. Your guests will love it. 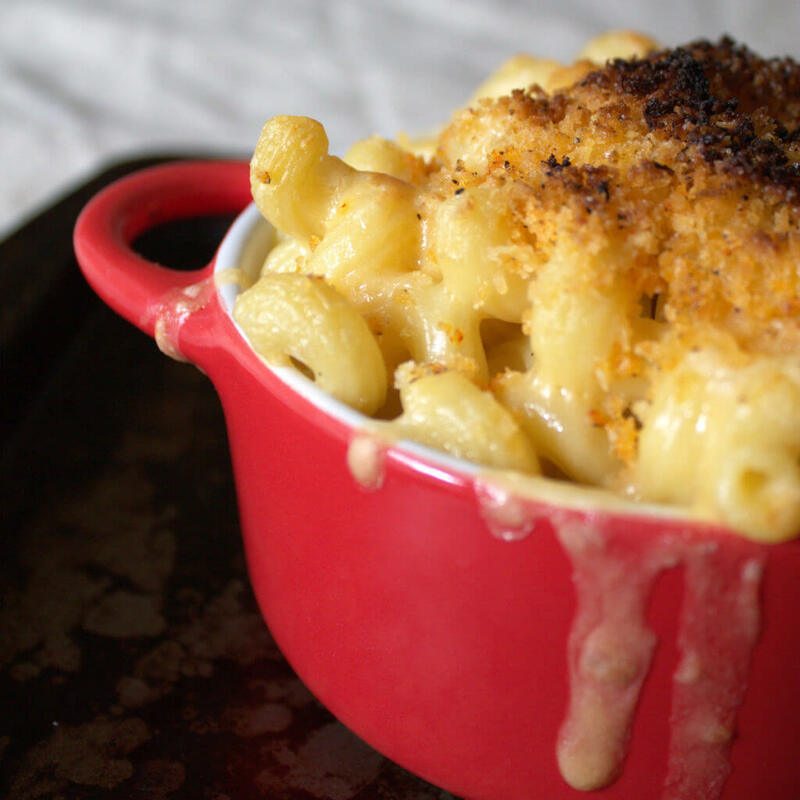 Want to take this fancy mac and cheese recipe to and even higher level? Add some sliced jalapenos, caramelized shallots, or pulled pork to the top before serving. You could even set out a few topping options and let your guests decide how they want to dress up their own dishes. You know we love a good buffet bar around here, so be sure to check out our Bagel Bar Brunch post for more inspiration. Cook the macaroni according to package instructions. Drain well and set aside. Melt 2 tablespoons of butter in a thick-bottomed sauce pan over medium heat. Whisk in the flour and let it cook for 1 to 2 minutes or until it browns slightly. Reduce the heat to low and whisk in the milk until well blended. Cook for an additional minute until the sauce thickens. Stir in the gruyere, cheddar, pecorino, 1 teaspoon salt, pepper, and nutmeg. Allow the cheese to melt slightly and stir in the cooked macaroni. Pour into 2 individual-size gratin dishes. Melt 1 tablespoon of butter in a small bowl in the microwave. Add the panko, 1/4 teaspoon salt, smoked paprika, and cayenne pepper. Toss well to combine. Sprinkle the panko mixture over the top of the pasta. Place in the oven and bake for 35 to 40 minutes, or until the sauce is bubbly and the macaroni is browned on the top.